With two smash hits to its credit, Lawrence University looks to make it three in a row with its third edition of Giving Day. 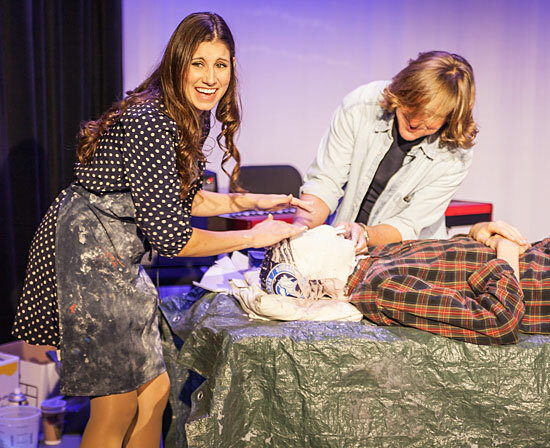 Giving Day can be a learning experience as co-host Kasey Corrado found out in 2015 when she worked with art professor Rob Neilson to create some living art — a face mold. From athletics to art, dance to diversity, physics to philosophy, virtually everything you want to know about what’s new and interesting at Lawrence will be discussed Tuesday, Nov. 15 during the college’s third annual 12-hour Giving Day extravaganza. The 9 a.m.-to-9 p.m. show will be webcast LIVE at go.lawrence.edu/givingday and will feature dozens of special guests and performers from all corners of the campus throughout the day. Lawrence President Mark Burstein, dance instructor Margaret Paek, theatre director Timothy Troy, Kimberly Barrett, dean of diversity and inclusion, classics professor Randall McNeil, the Lawrence Fiddle Club and Porky’s Groove Machine are among those who will share their insights, perspectives and talents. Kasey Corrado, Lawrence’s director of social media, returns for her third year as “ringmaster” of the show. She will be joined by first-time co-host Ken Anselment, dean of admissions and financial aid. “When you’re given that signal that you’re ‘live,’ it slowly but surely sinks in that you have a marathon and not a sprint ahead of you,” said Corrado. “But this is such a wonderful opportunity to celebrate all that is Lawrence. In 12 hours, we’re able to showcase current students, connect with alumni, interact with faculty, talk with staff, and of course, share appreciation for our generous donors. 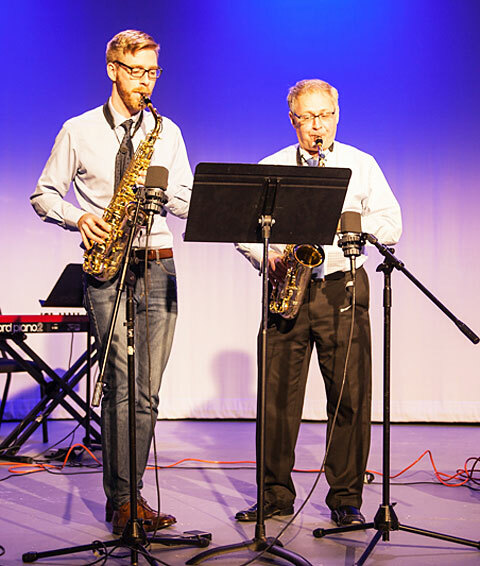 Great music is a staple of the Giving Day live show as faculty saxophonists Sumner Truax and Steven Jordheim proved last year. Being in front of a camera is nothing new for Anselment, who previously has “starred” in a pair of Lawrence April Fool’s Day videos, but he admits those productions weren’t exactly perfect preparation for a 12-hour stint in front of the camera eye. “I’ve stood behind college fair tables for four hours at a time and I’ve run a handful of half marathons, but I have never tried to do all of that in one day,” said Anselment, a 12-year veteran of admissions and financial aid operations at Lawrence. 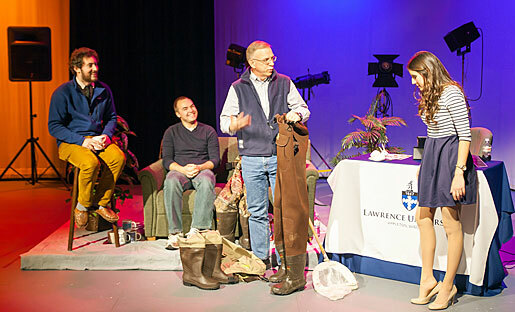 Lawrence held its first Giving Day in 2014 as a one-day-only fundraising event for alumni and friends to show their support for Lawrence and its programs. The first year, with the help of “game changers” who promised to match gifts, raised $1.1 million for the college. Last year, more than 2,300 donors generated $1.36 million during the second Giving Day event. For this year’s event, more than 140 alumni, parents and friends have agreed to serve as “game changers” by providing matching funds to motivate others to support the college and its students according to Ben Campbell, Lawrence’s director of annual giving. Exhibiting her apparent high pain threshold, Rachel Crowl has returned to perform her masterful behind-the-scenes wizardry as the webcast’s all-important producer/director for a third straight year. With encouragement from biologist Bart DeStasio, Giving Day co-host Kasey Corrado gets ready to do some field research gear. “I’m fully prepared for things to once again go wrong in ways I never expected and I can’t wait to watch us catch ourselves again before we fall,” said Crowl, who has spent months lining up guests and organizing the show. She’s promising a more music-infused program for year three along with the usual staples. “I’m hoping to have at least one jaw-dropping musical performance very hour. We’re also going to take a look at some of the mainstays of a liberal arts college, like philosophy and classics, do a little science, learn about public art, make some chili, do some dancing, make some noise.